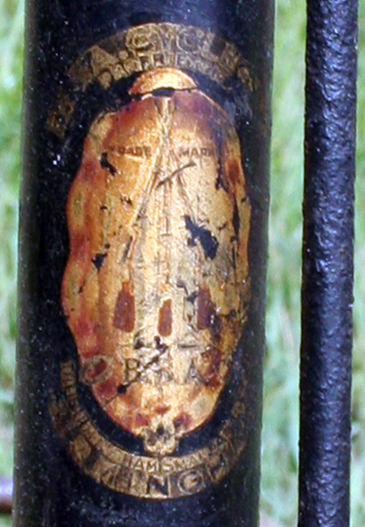 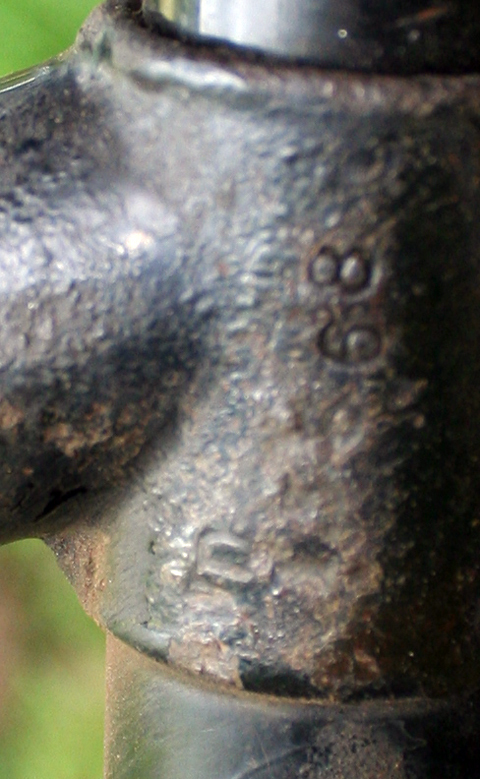 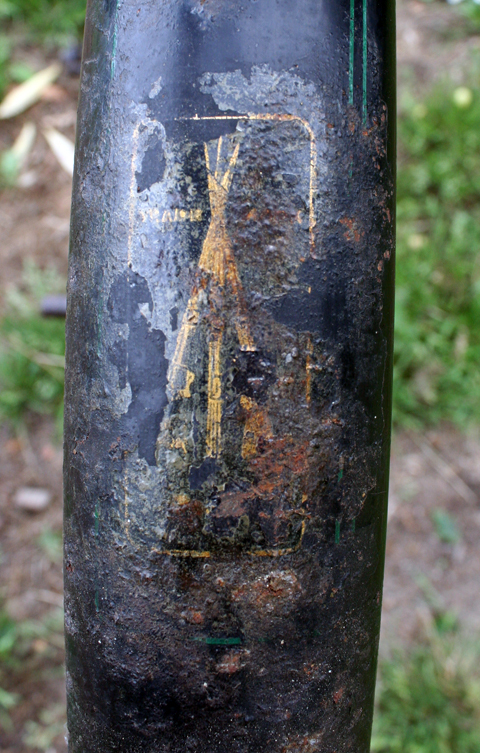 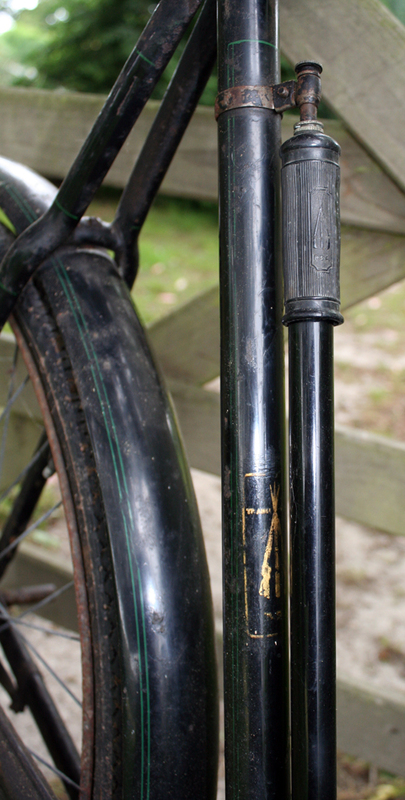 This post-WW1 military BSA with a ‘WD’ frame number is a good example, still showing its original black paint rather than army green. 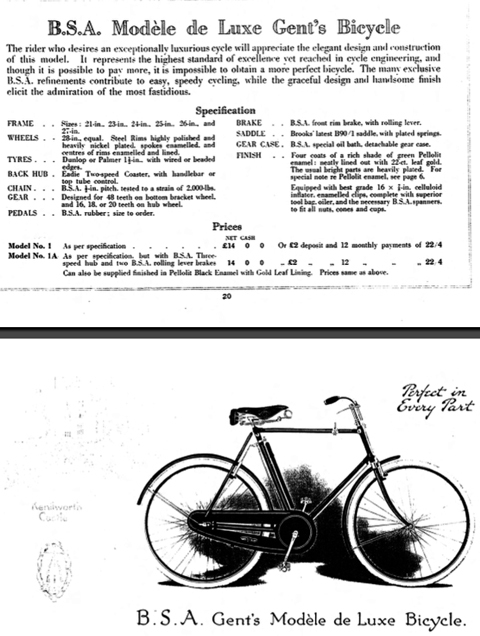 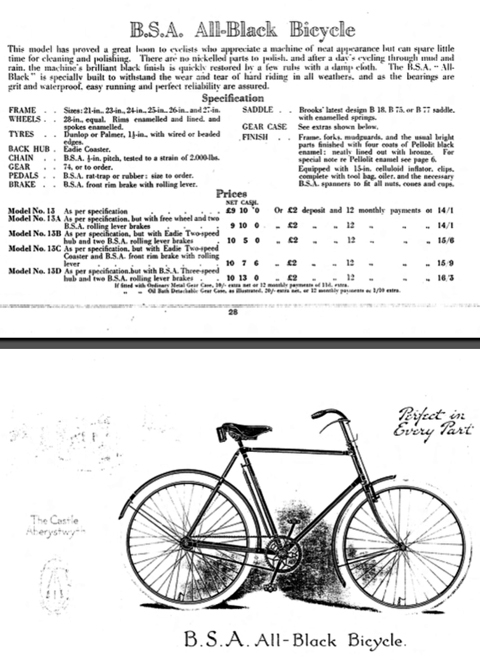 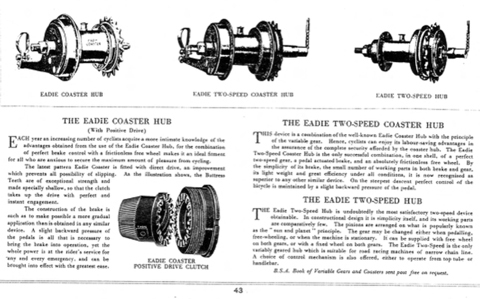 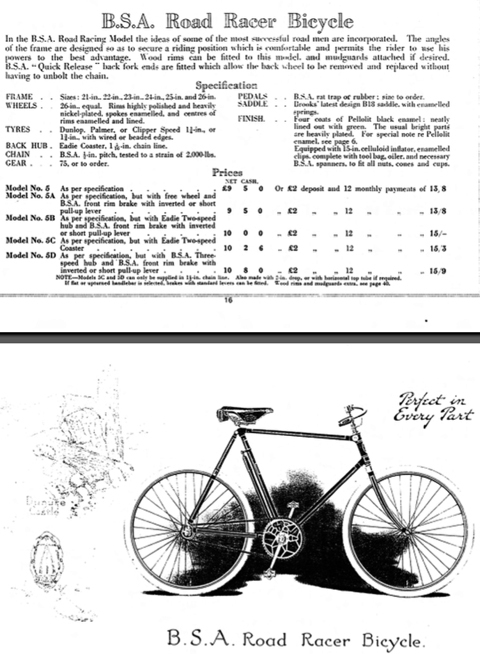 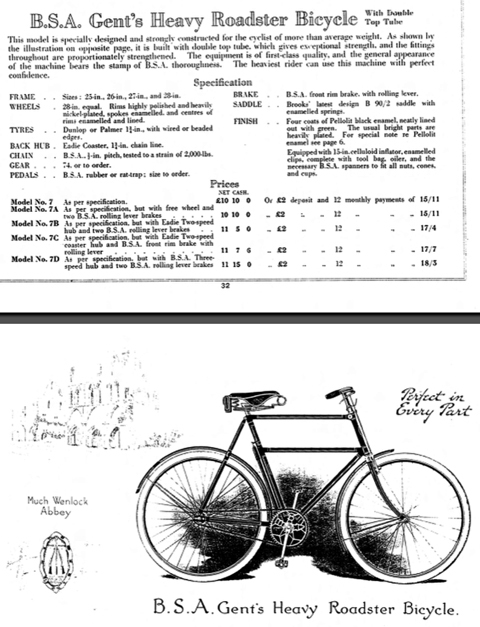 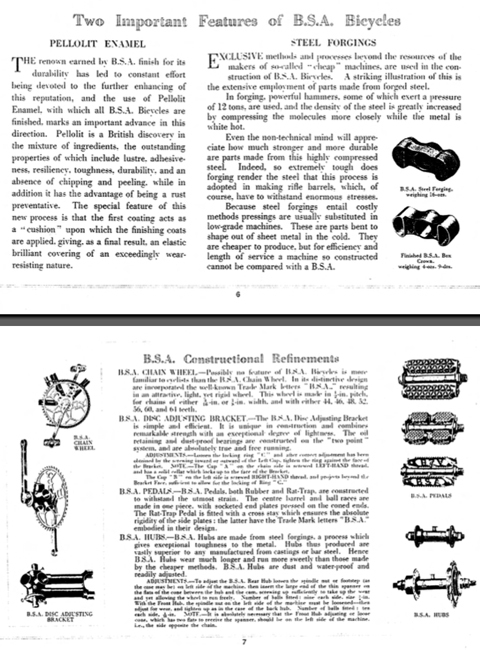 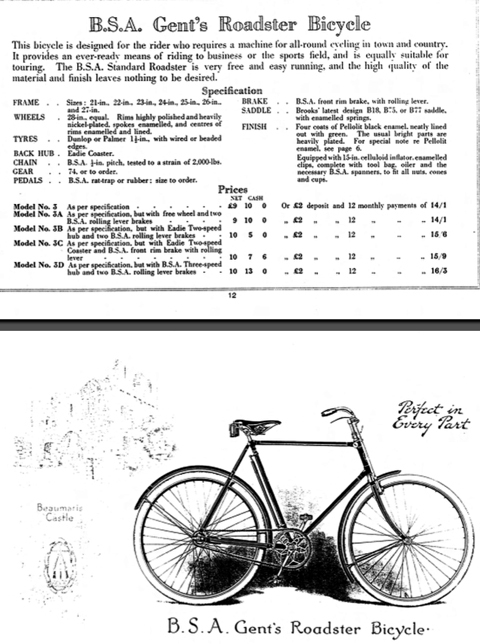 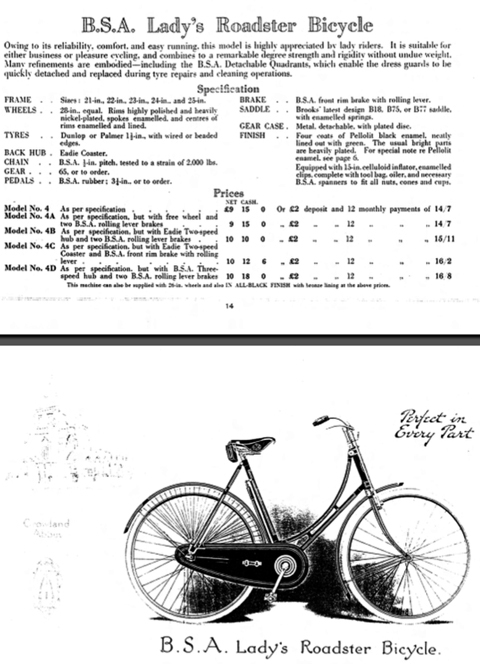 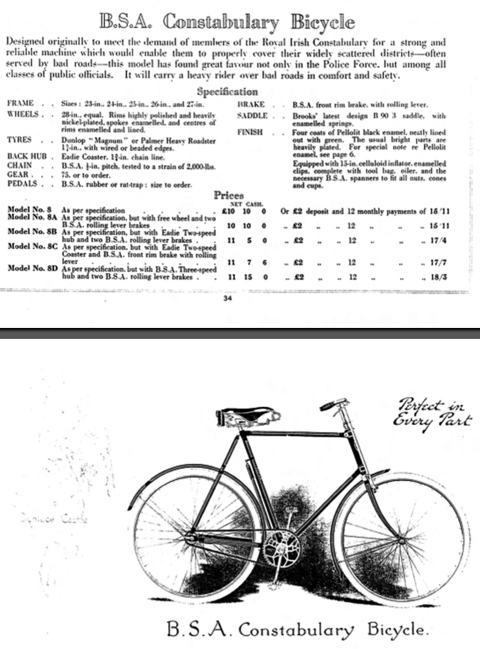 The specification for the Military Roadster is a mixture of various options in the BSA catalogue, ie detachable gear case, Eadie Coaster hub, Brooks B90 saddle. 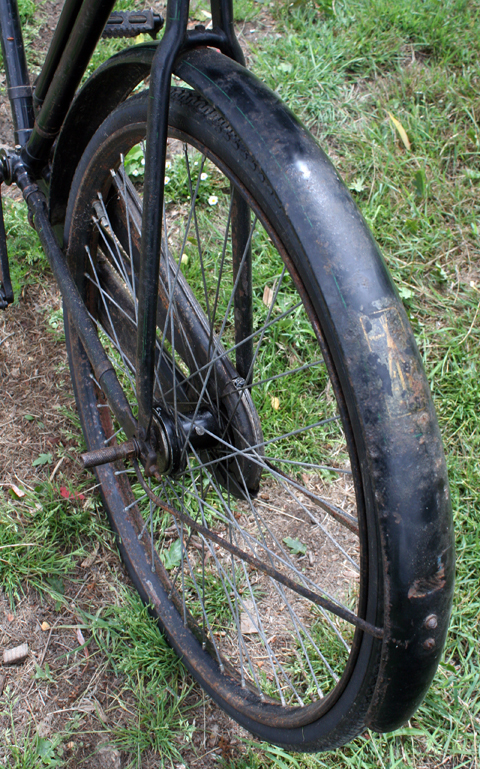 The paintwork has lasted well for a 90-year-old machine, and it still has its original box-lining. 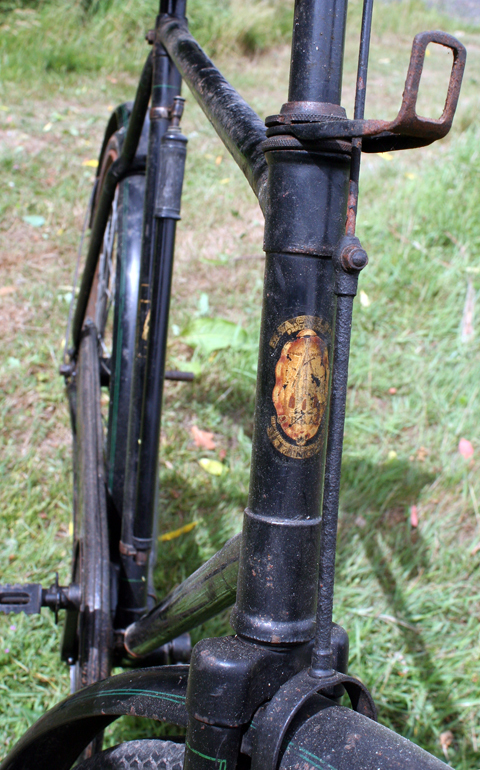 Though faded, all the BSA transfers around the bike are discernible. 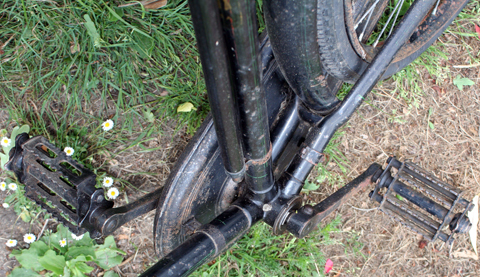 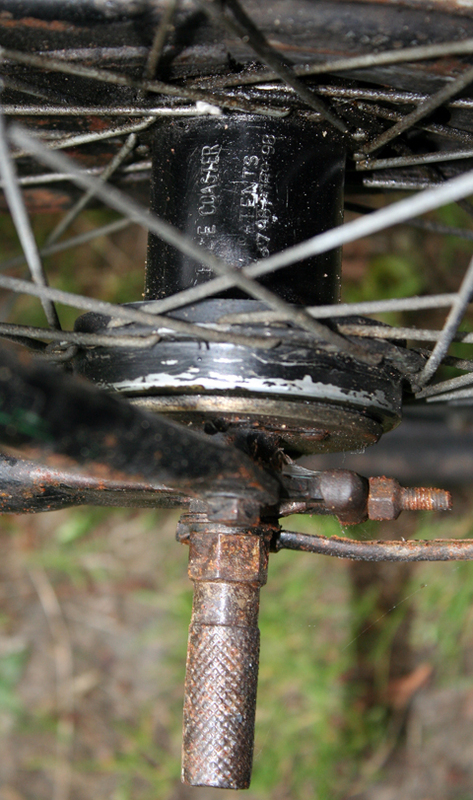 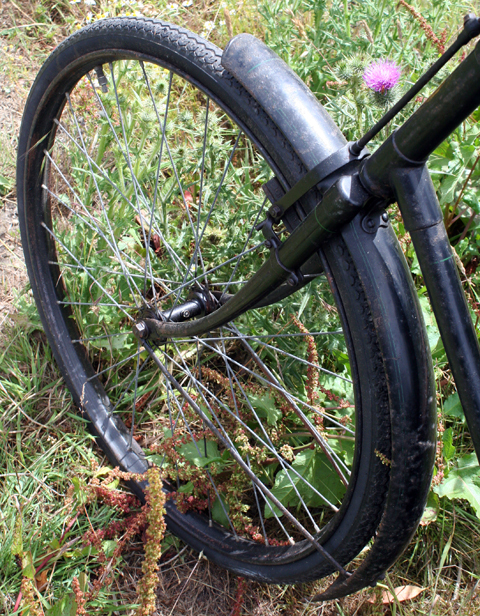 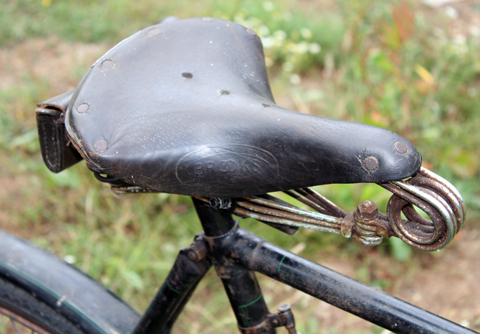 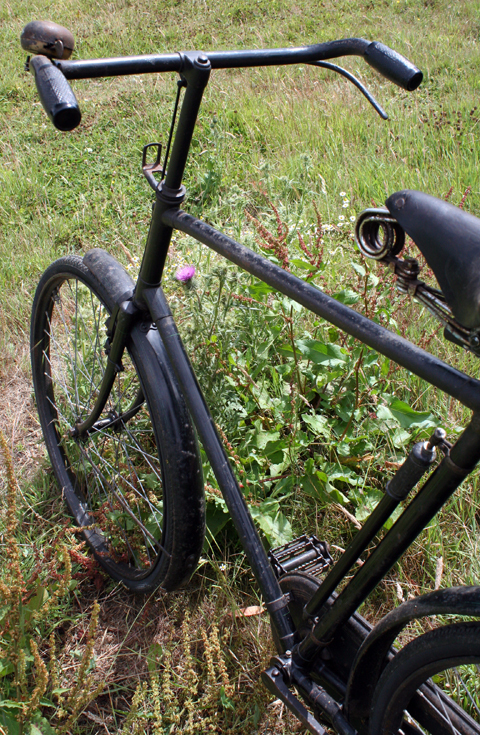 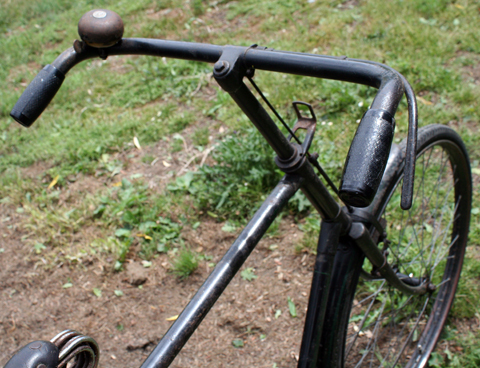 You can easily tell when a bike is fitted with a coaster brake – there’s only one brake lever. 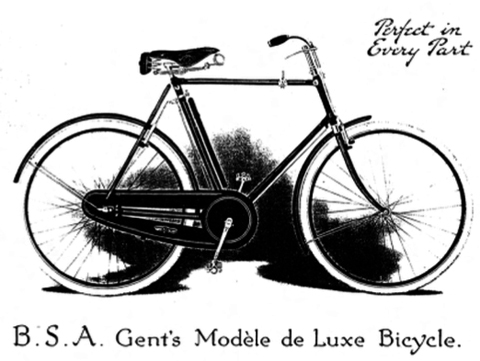 Except for the gear trigger on the crossbar, the appearance of the Military Roadster is similar to the Gent’s Modele de Luxe. 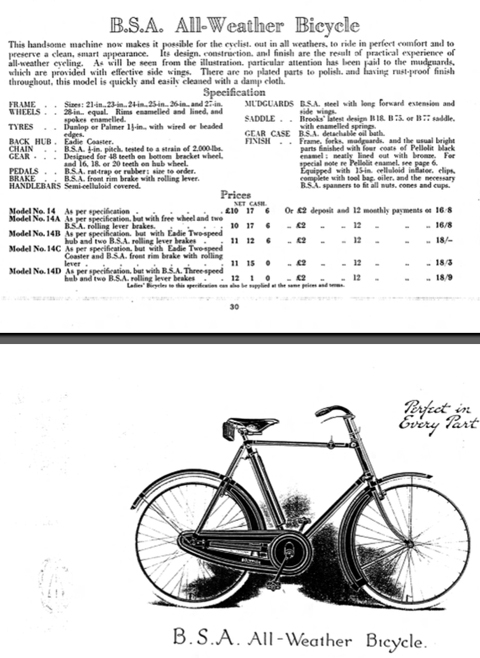 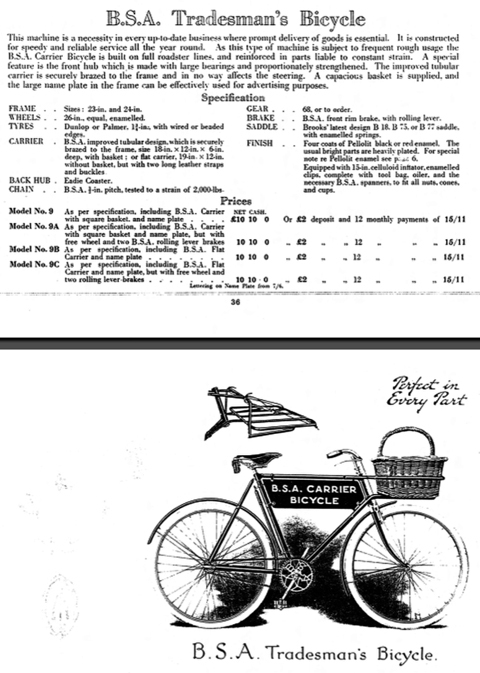 While researching Alldays & Onions, a company that supplied the government with military bicycles and also made a name for themselves with tradesmen’s bikes, I discovered that their military bikes were essentially the same as their trade bikes but without the basket frames. 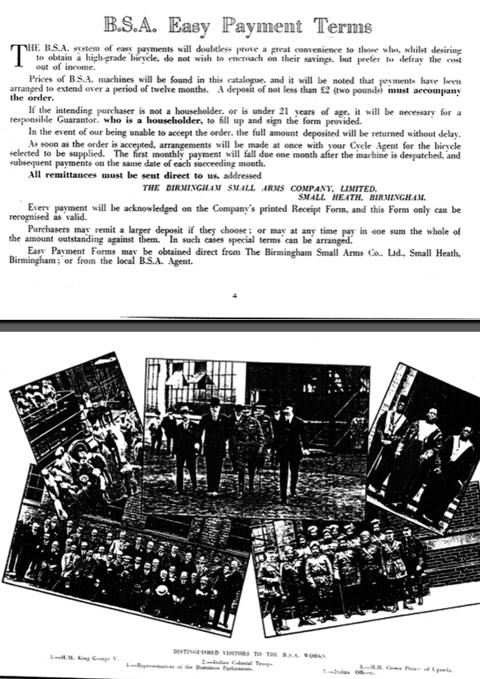 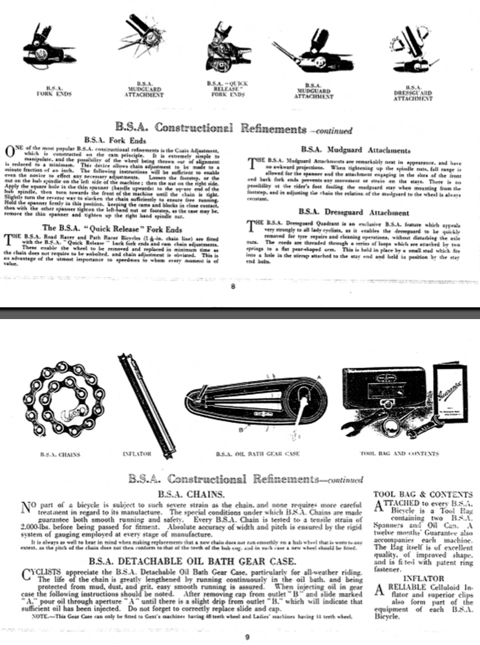 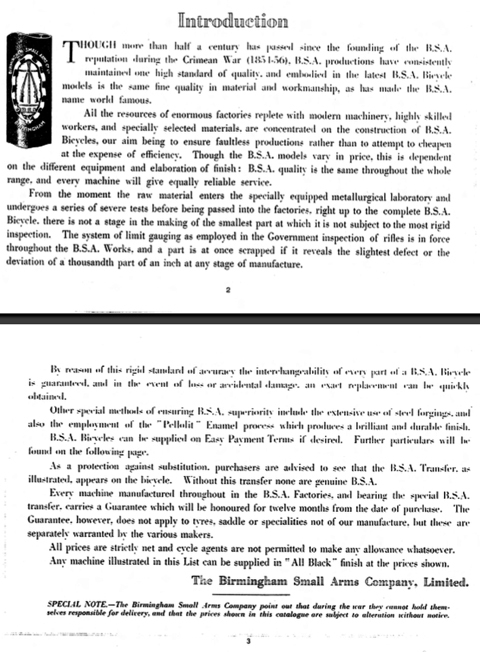 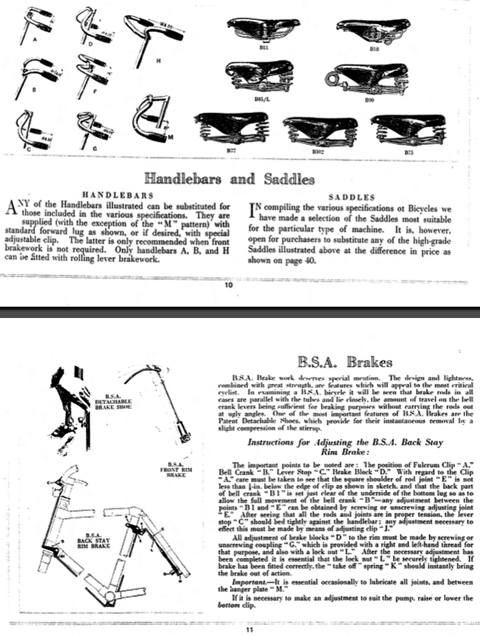 I had suspected this to be the case, and I assume that the military BSA was also similar to BSA’s Tradesmen’s model and the heavy-duty Policemen’s model; you can see the catalogue pictures for both at the bottom of this page. 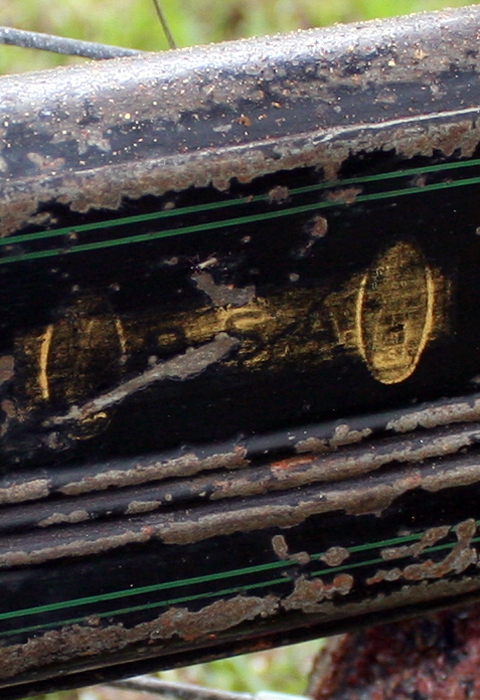 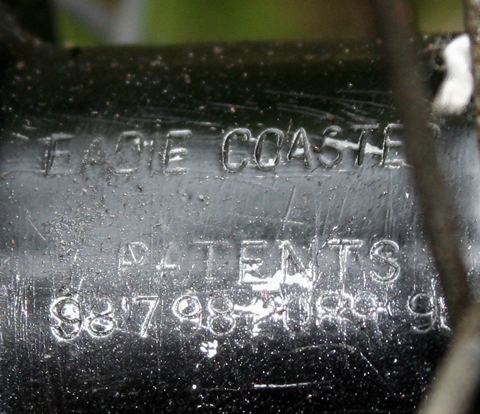 Though the chain-guard transfer has mostly faded away with time, the BSA name still shines through. 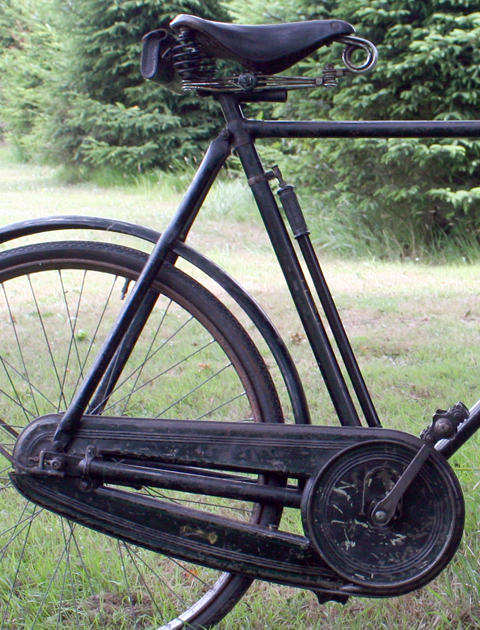 Although you wouldn’t guess its military origins from the original black paintwork, the ‘WD’ prefix on the frame number denotes that it was a military bike. 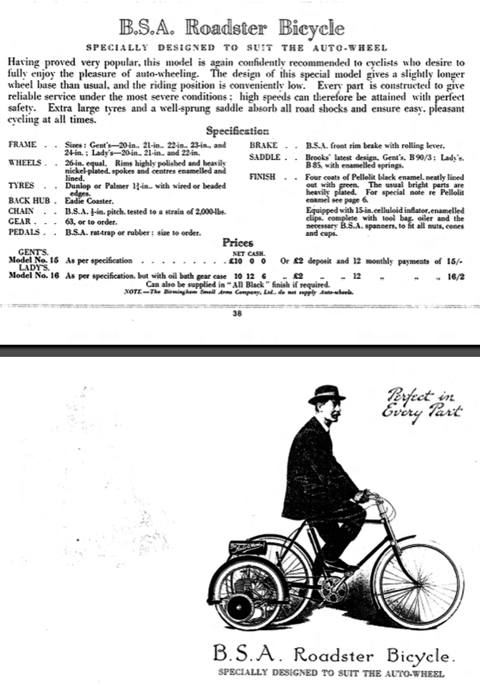 The soft and airy lightness of civilian clothes, the broad brogue shoes, the spotless white collar, the boating flannels, the tennis blazer, and the BSA Bicycle. 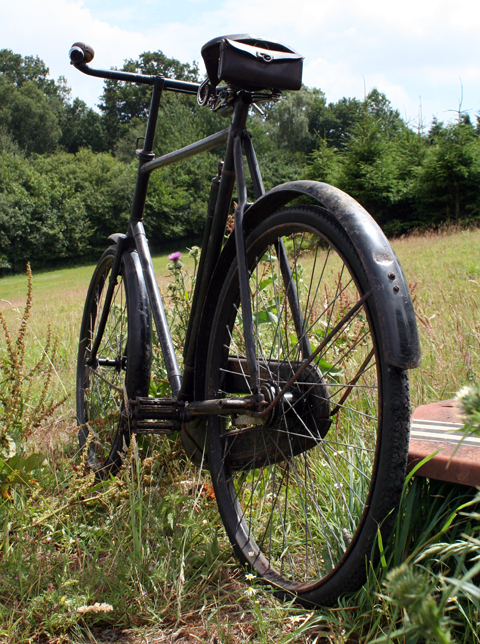 You have left behind the uniformity and discipline of war and the fullest joys of summer are waiting your pleasure. 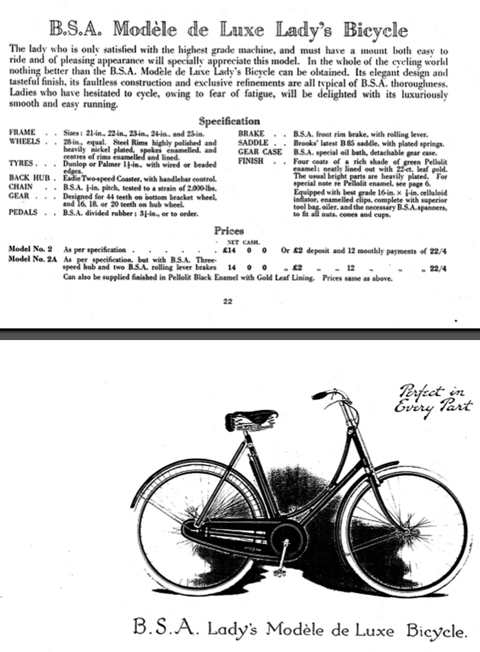 The simplest and easiest method of making the most of your leisure is by the purchase of a BSA Bicycle. 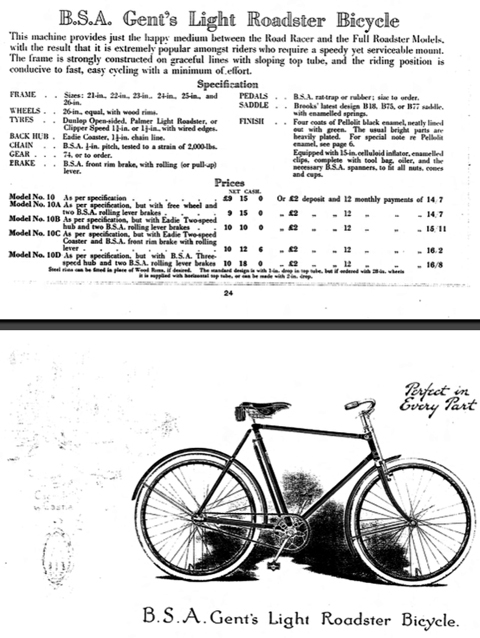 It will pay you in the end to choose only the best when buying your post-war bicycle; think of the future and do not be persuaded into buying a so-called cheap make. 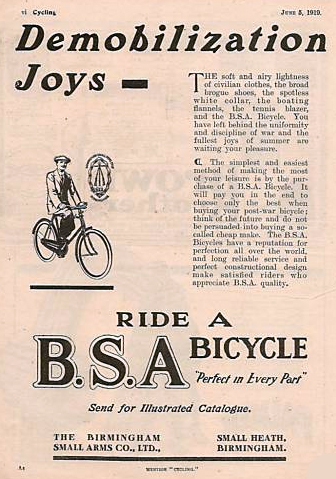 The BSA Bicycles have a reputation for perfection all over the world, and long reliable service and perfect constructional design make satisfied riders who appreciate BSA quality. 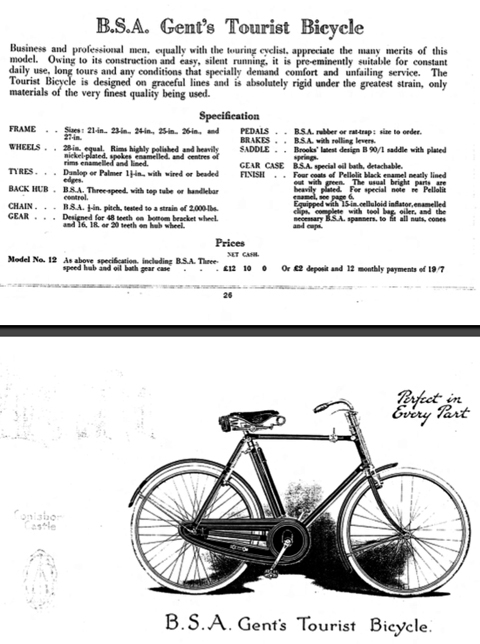 WHY NOT CYCLE those hundred-and-one train, tram and bus journeys on an BSA Bicycle. 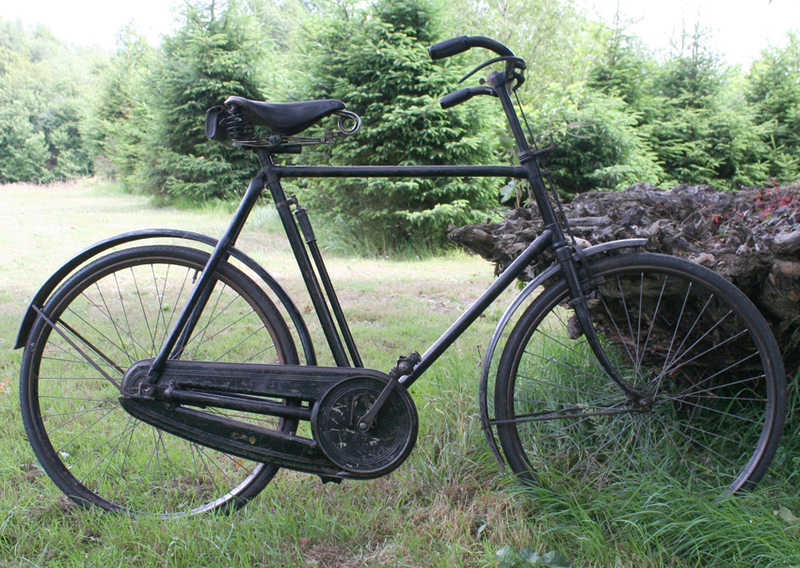 There is no trouble, just jump on and away and your destination is reached in quicker time and under more pleasant conditions than exist in unhealthy crowded conveyances. 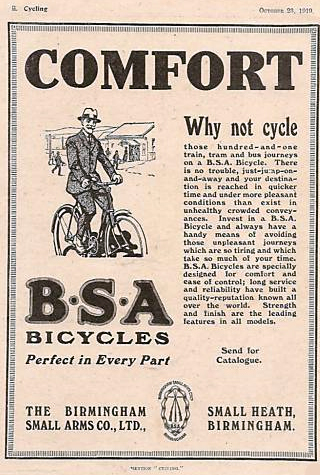 Invest in a BSA Bicycle and always have a handy means of avoiding those unpleasant journeys which are so tiring and which take so much of your time. 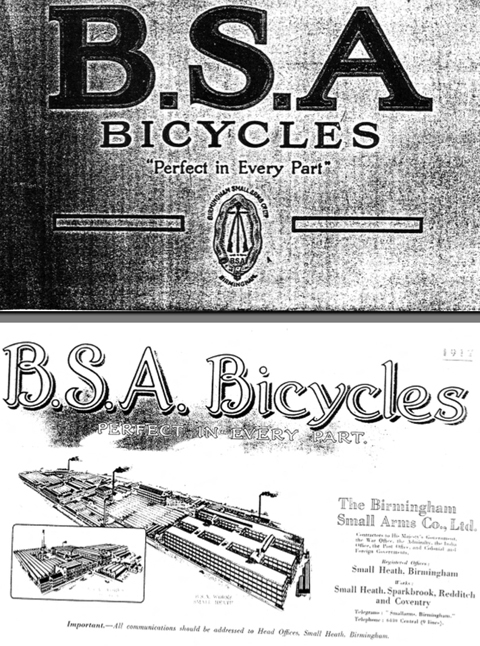 BSA Bicycles are specially designed for comfort and case of control; long service and reliability have built a quality-reputation known all over the world. 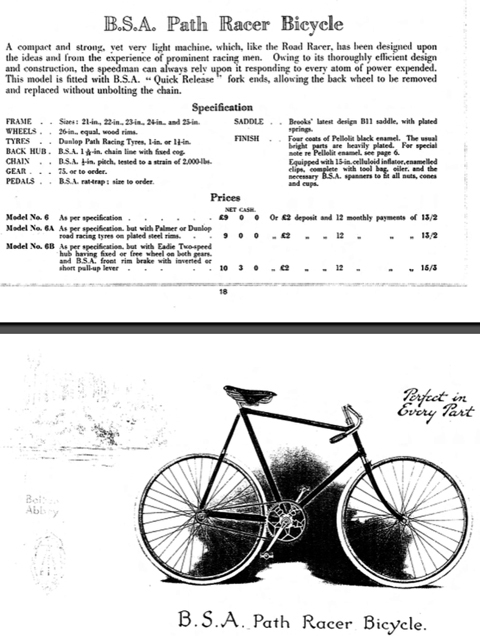 Strength and finish are the leading features in all models.